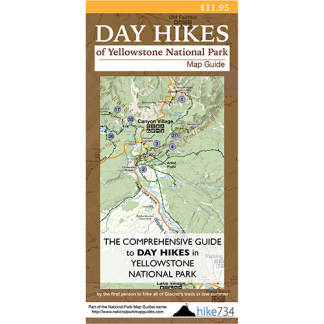 This trail follows the beautiful north rim of the Grand Canyon of the Yellowstone, and offers a few side trails to overlooks and the brinks of the two main falls. The trail starts at the north side of the Chittenden Bridge where it follows the river downstream. The walking is easy on an old road that crosses on the beautiful Canyon Bridge. The first spur trail takes stairs down to the brink of the powerful Upper Falls. The perch is right above the falls, allowing you to watch it drop 109ft/33m below you. Continue on the North Rim Trail where it heads up past the Upper Falls parking and along the road until you see the sign for the North Rim Trail. The dirt trail breaks off to the right. A short distance down, this path take the spur trail to an overlook of Crystal Falls. After the spur trail, the North Rim Trail crosses Cascade Creek right above Crystal Falls. It continues along with a couple of views looking down on the river and one view looking back at Upper Falls. Take the paved path down nine switchbacks to the brink of Lower Falls. 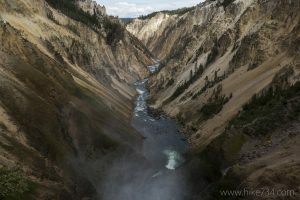 It is incredibly powerful to be so close as the Yellowstone River spills 300ft/90m down and tumbles through the canyon. Return back up the trail and continue on a paved section of the North Rim Trail, which has a parking lot on one side and many wonderful overlooks of the canyon on the other. At the end of the parking lot, the trail descends into the trees, on a dirt path, with intermittent views of the canyon on the way to Lookout Point. Once again, a parking lot and a paved path lead to this nice overlook. Follow the Red Rock Trail, with it’s interesting rock walls, down almost 300ft/90m to a view looking straight at Lower Falls. Return to the top to continue on the North Rim Trail. From here to Grand View, the paved path gives you numerous great views right along the edge of the canyon. The great, distressed, yellow rock formations form spooky towers up and down the canyon while the river rages below. Grand View offers even more views of the magnificent canyon and across to the visitors at Artist Point. From here, the trail turns to dirt and takes you to more great vantages before disappearing into the forest. More viewing opportunities appear as you approach Inspiration Point and its parking lot. Turn around and head back here. If you have arranged a car shuttle, you can make this a shorter, one-way trip with a total distance of 4.7mi/7.6km including the spur trails. Trailhead: Park at the signed parking lot for Wapiti Lake on the South Rim Drive, just east of Chittenden Bridge located south of Canyon Village. Follow the paved path that begins in the northwest corner of the parking lot, down to the bridge and across to the signed North Rim Trail trailhead.